Melbourne boasts a wide variety of architectural styles. This insiders Melbourne city guide will introduce you to the developments of architecture in Melbourne over the last 170 years. The first Melbourne buildings were built between 1840 and 1870. They followed the Georgian or Colonial Style. This is a rather rustic style, lacking the decorations and picturesque rooflines of the Victorian style. There are not many buildings left from that period. Victorian Architecture shaped Melbourne between 1870 and 1890, the heydays of the Melbourne gold rush and resulting land boom, coined Marvellous Melbourne. In this period excess and eclecticism reigned. Many of the terraces of the inner Melbourne suburbs are from this era. The Block Arcade, the Royal Exhibition Buildings, Parliament house, the GPO, Hotel Windsor and the Princess Theatre are built in the Victorian architectural style. Between 1890 and 1915, Edwardian architecture dominated Melbourne Australia. Art Noveau styles also emerged during this time. Flinders Street Station and the Public Baths are survivors from this period. During the years between the world wars and into the 1940s, Art Deco styles as well as other modern styles emerged in Melbourne. 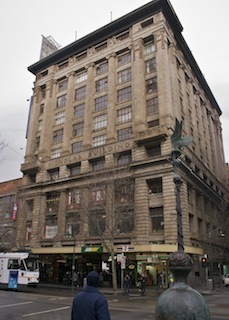 The Nicholas building and Myer are from this period. The 1950s saw a modernisation of the city. A lot of traditional Melbourne architecture was removed and replaced with plain modern buildings. This trend of destruction of the old continued in the 60s and 70s, with whole blocks of old buildings being removed to make way for the new. High rise housing commission buildings are also from this period. The 1980s were dominated by corporate culture, concrete and glass. The rialto tower was built. This tend continued into the 90s. However, it was also in the 90s that historic buildings were being valued and restored again. The Melbourne boom of the late 90s resulted in developments such as the Docklands, Southbank and the Crown Casino. This boom has continued into the 1990s. Todays styles are often complex. There is glass and steel that somehow organically fits into the older city. 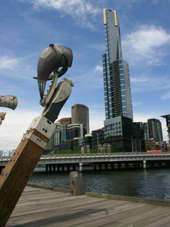 The Eureka tower was completed in 2006. 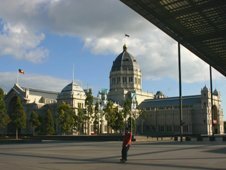 Here is more on Melbourne architecture. Return from Melbourne City Guide to Melbourne Home Page.